One of my favorite Christmas traditions is making an evergreen wreath to hang on the chimney of our house. Since the chimney is tall and quite large, the wreath must also be relatively large. I begin by covering my table with a protective cloth and then gather my supplies. When I first started this tradition, I worked outdoors, but since it takes a few hours to complete, I would freeze, so I now do everything indoors. This means more to clean up, but I’m warm and can listen to music as I work. I use a strong wooden form that is 4 feet in diameter. Mike made this from plywood and he spaced holes every 8 inches or so to keep the wire from sliding. 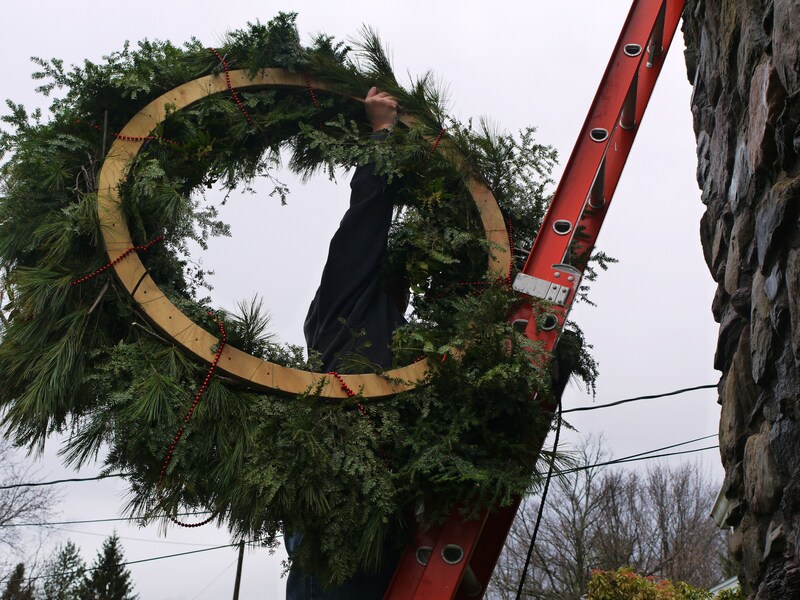 We have a heavy duty chain attached for hanging – the finished wreath is quite heavy. 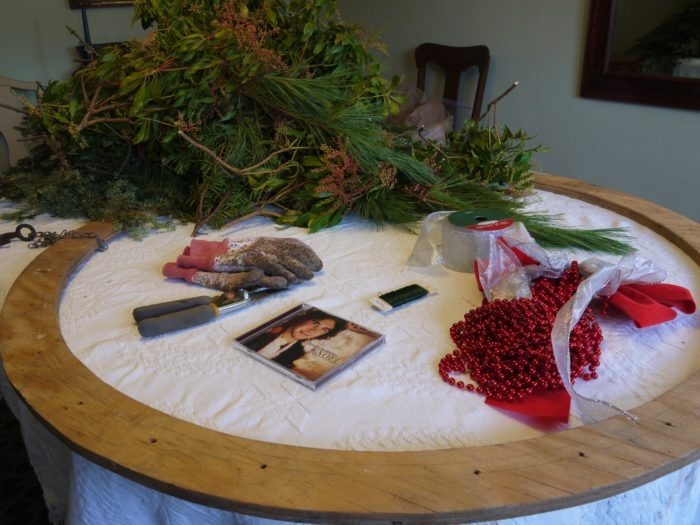 Other supplies include work gloves, hand clippers, wire, beads, ribbon, and of course, an abundant supply of greens which are cut into approximately 2 foot pieces. The last item needed is your favorite Christmas music to play while you work. Now you’re ready to begin. First, gather a large handful of greens. 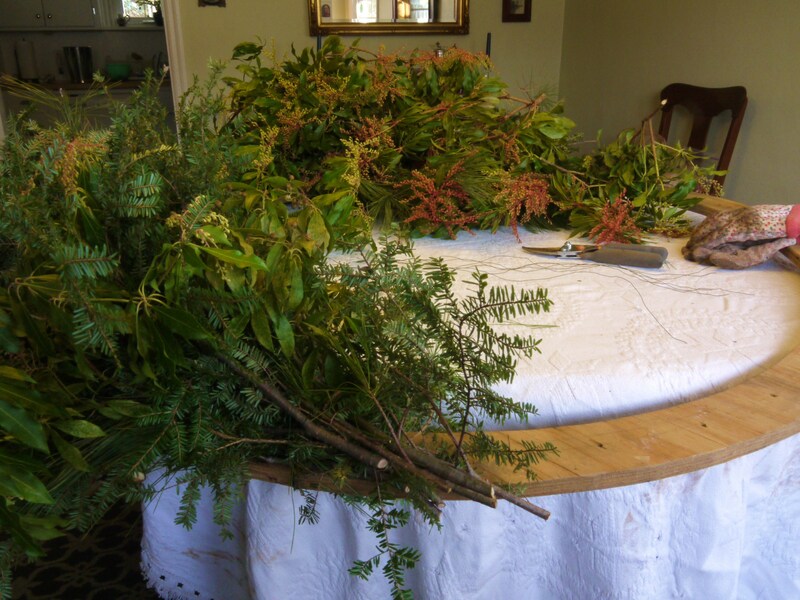 I use white pine, hemlock and branches from other evergreen shrubs growing in our yard. Tightly attach these to the base with wire. 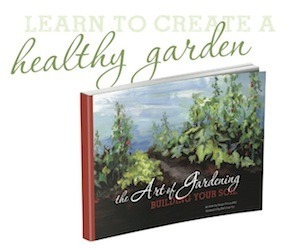 Gather another bundle of greens and place it so that it overlaps the first bunch and covers the stems. Make sure that the stems on both bunches face the same direction. Continue in this manner until you have worked your way around the entire form. The last few bundles will have to be tucked under the first one. You are now ready to add your finishing touches – beads and ribbons. 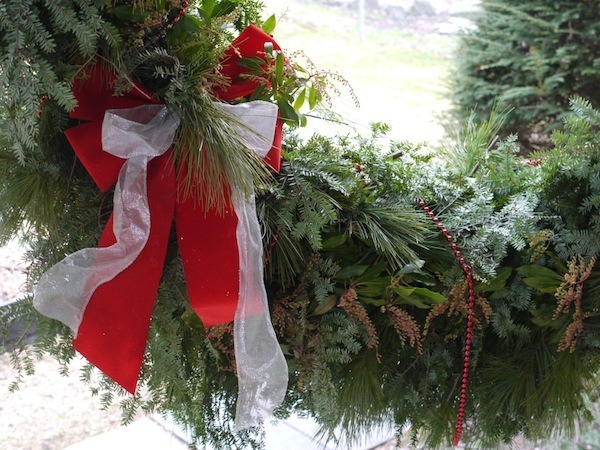 Your completed wreath is ready to hang! Beautiful wreath!! I wish I could attempt something like this here in TX but the evergreen branches dry up and turn brown too quickly in our mild winters. Thanks, Jennifer! I guess in this case there is an advantage to living in the north! 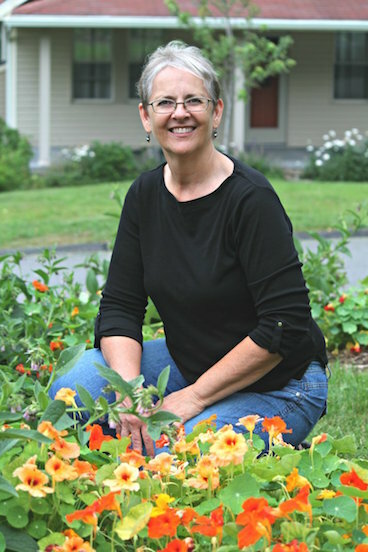 I wonder if there is any alternative plant that would work for you. I once did a wreath that was made of moss and living ivy with roots. I had to keep watering the moss. boxwood, magnola, asparagus fern, camilla (all green in the winter in the south) and pyracantha (red berries) would be beautiful. I love that you can be creative and make a wreath with whatever is native to your area! I love that wreath , it looks beautiful on that wonderful chimmney, and my son is the very best wreath hanger!! I guess he takes after you – the best! Thanks for all your encouragement. Susan! The wreath is absolutely beautiful! I will have to ask Albert to make me a form like that and then maybe we can have a wreath making day sometime! Sounds wonderful, Melissa. I’m looking forward to soap making as well. Motherrrr!!! I can not wait to see what you write next! My dining room table has been covered with my next post for the past few weeks! I love you! 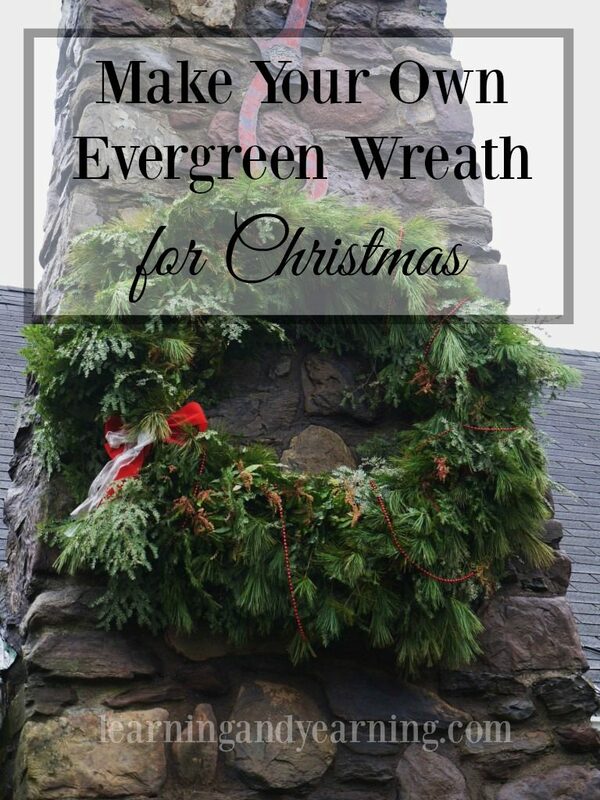 The stone chimney is a great backdrop for such a big and beautiful wreath. Thanks, Sara. The chimney is one of the things I love about the house! Mike put a spotlight on the wreath last night. Can’t wait to see you on Christmas! Susan, this wreath is absolutely outstanding! It is so beautiful. And your home is adorable. Thank you, Nicole. It’s one of my favorite projects each year! The wreath is gorgeous, but oh how I love your chimney..the shape, the variety of stone! Thanks, Kristel. It’s one of the things that attracted us to this house. Once in a while I worry about it falling – it would destroy the house! 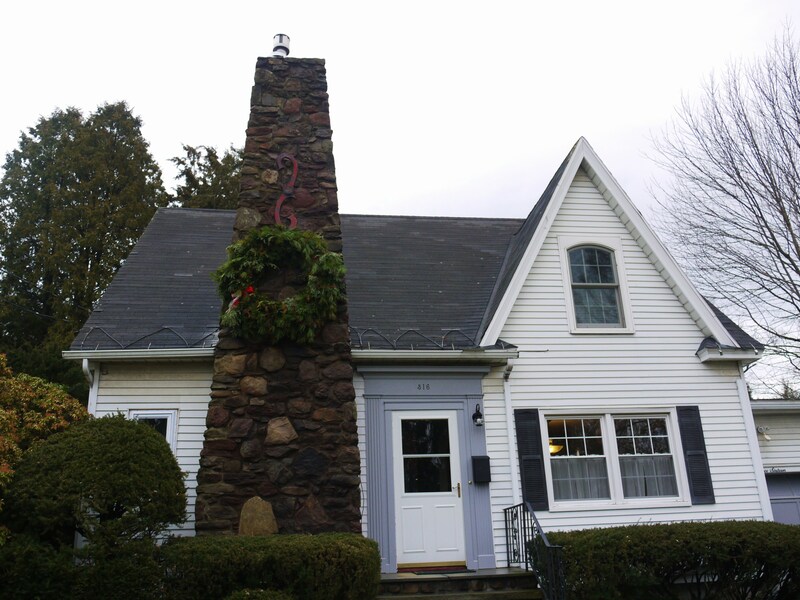 My question is…how did you hang the wreath on the chimney? I’ m going to attempt this in front of my dutch colonial house on the chimney…just don’t know the best solution for supporting the wreath? Any thoughts? Hi Ed, If you notice in the last picture, our chimney has a metal decorative scroll on it. We attach a heavy chain to the wreath and hang it on that metal.